Ibizan Hound Dogs | Ibizan Hound Breed Information - One Of The Oldest Purebred Dogs! The origins of Ibizan Hound dogs are to be found in ancient Egypt where they are believed to have hunted with the pharaohs. Evidence of this fact lies in depictions of similar looking hounds that have been discovered in tombs around circa 3000 BC. Even more interesting, when the tomb of King Tutankhamen was opened, a full size statue of a dog bearing a strong resemblance to the Ibizan was found. At some point in its early history, the Ibizan dog is said to have accompanied Phoenician traders to the island of Ibizan, from which its name is derived. 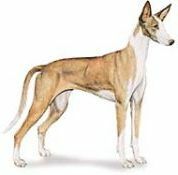 Bred primarily to hunt small game, Ibizans, classified as sighthounds, have the skills to get the job done, using their keen abilities of sight, sound and scent. This hound breed was original known as the Podenco Ibicenco and is recognizable by its tallness, prominent set of erect ears and a deer-like expression. These features, in addition to their streamlined physique, can be compared to those of the Greyhound and/or the Saluki. Ibizan Hound dogs are intelligent, loyal and affectionate. They like to learn and to please their owners, so training them is relatively easy. However, they are known to be very sensitive, so a gentle and consistent method is the best approach with lots of positive rewards. Toys and game playing are very popular pastimes with this breed. Ibizans tend be easily startled by unexpected activity and overly reserved around strangers. They need a well-rounded socialization with people, places and things, starting at an early age, to help overcome these traits. If the weather is chilly, this breed, having a very lean body mass, can feel the cold and will be grateful for the benefit of a coat. A warm place to sleep is also preferred, for the same reason. There are two different coat types, either long and rough or smooth and short. In both cases, the coat is close and dense. Ibizan Hounds are clean dogs and grooming is easily handled by brushing or rubbing down, depending on the coat type, about once a week. Shedding is less for the smooth coat and about average for the rough coat. Color variations: White, chestnut, tawny or any combination of the these colors. These dogs need a good amount of daily exercise such as long walks or jogs. Dog parks (providing they are fenced) can be a great venue for off-leash running and socializing. If you have property where they can run, be sure it has a secure high fence. They have a reputation as fence jumpers and a strong instinct to chase anything that moves. Another alternative is to involve the Ibizan in lure coursing, this is an excellent activity for their high energy and natural hunting abilities. When exercise time is limited or weather is harsh, the use of a dog treadmill can be a handy substitute. Daily exercise which addresses both mental and physical needs is a higher priority than space. That being said, a home with access to a securely fenced outside area would be the most ideal situation. Ibizan hound dogs are affectionate and get along well with children. Being a very playful sort, they will love being included in any games youngsters care to play. 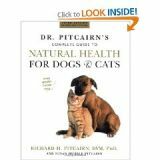 As with any breed of dog, we recommend that owners always have an adult present when pets and children are interacting. This breed's loyalty and even temperament makes them good companions for any family including elderly or sedentary environments. BUT, in all fairness, providing for the Ibizan's exercise needs must be the main consideration. Current resource on Ibizan Hound dog breed information, history, characteristics and attributes, grooming, puppy care, housetraining, nutrition, basic training, health care and disorders that may concern the breed. Many color photos.